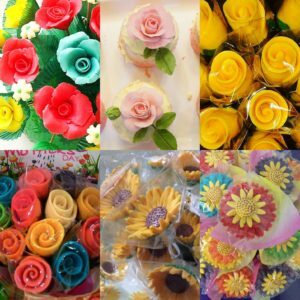 Here’s a recipe of How to make Pastillas Flower or Rose Pastillas. This is the recipe used in Baking Seminars for Pastillas Fondant Cake. You don’t need to spend a lot for seminars because you can easily learn it even just at home. Moreover, you can earn an extra income while you’re just at home. Uncover your artistic side and use your imagination to create beautiful flower arrangements. You can also use a flower cutter to make different flowers, shapes and not just roses. I hope you enjoy making these Flower Pastillas, its not just food. Its Food Art. Bring out that hidden talent in you. Start selling these Rose Flower Pastillas and boquet of flowers on Valentines Days, Mother’s Day and Teacher’s Day. In mixing bowl, pour gelatin and hot water. Stir it to combine and add in condensed milk. Mix it well until well incorporated. In the same bowl, then add in powdered milk. Continue to mix until well combined. Gradually add in powdered sugar then knead. Cover it tightly and refrigerate it for an hour to set. Once ready, rub hands with lard, so it will not stick in your hands. If its a bit watery in texture (malabsa), just add more powdered milk until it becomes clay like in texture. Add powdered milk little by little until you get the perfect dryness and pliability. Divide the pastillas dough into equal parts depending on how many colors you want. You can add a drop of gel coloring in each dough and knead it until well combined and your desired color is achieved. Use rolling pin or a clean thick pen (like the size of a pentel pen), place a clean plastic on top of each ball of pastillas and start flattening. Flatten each ball and make it really thin on the edges. Then start assembling each petals on a lolli sticks until you form a rose. For Unbloomed Rose: Slice the log into 2 portions, flatten and shape it into an elongated oval just like a banana peel. Make it very thin on the edges. Roll it into a spiral shape until it looks like an unbloomed rose. For Full Blossomed Roses: Roll it into logs and slice into a peso coin size balls. Slice it into different sizes, because each petals should not be in same size. The center petals should be smallest, smaller, medium and large. Arrange it in baskets with styrofoam underneath or boquet style and just wrapped it in japanese papers or plastic wrappers. You may also use green cellophanes to line the flower buds underneath (to look like leaves) or use green paper cups (put a hole in the center of small green paper cups and insert the lolli stick to serve as a rose cup).